I’d seen these displayed right at the counter at Blockbuster for some ridiculous price that I hope nobody paid, but here on the closeout rack at my supermarket, they were asking only 25 cents. How could I not buy one? I could have just given you a list of what the various hearts say, but I wanted you to see the abysmal printing job. Seriously, there’s no excuse for that. 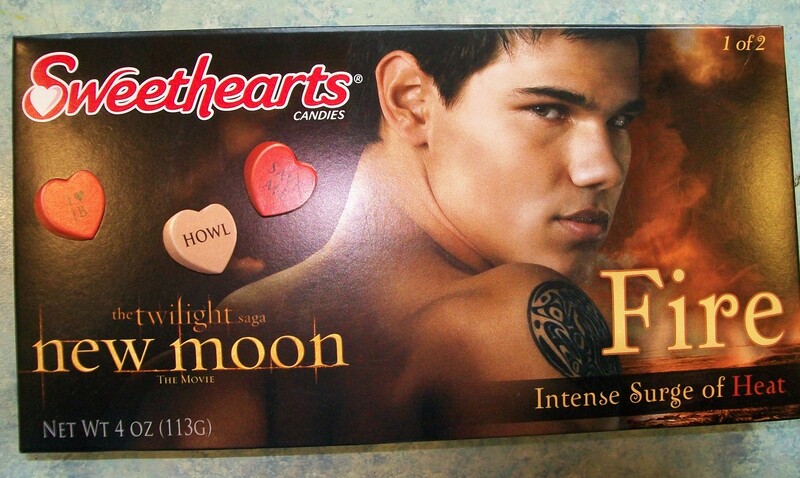 Several of the hearts in the box were completely unreadable or even blank. 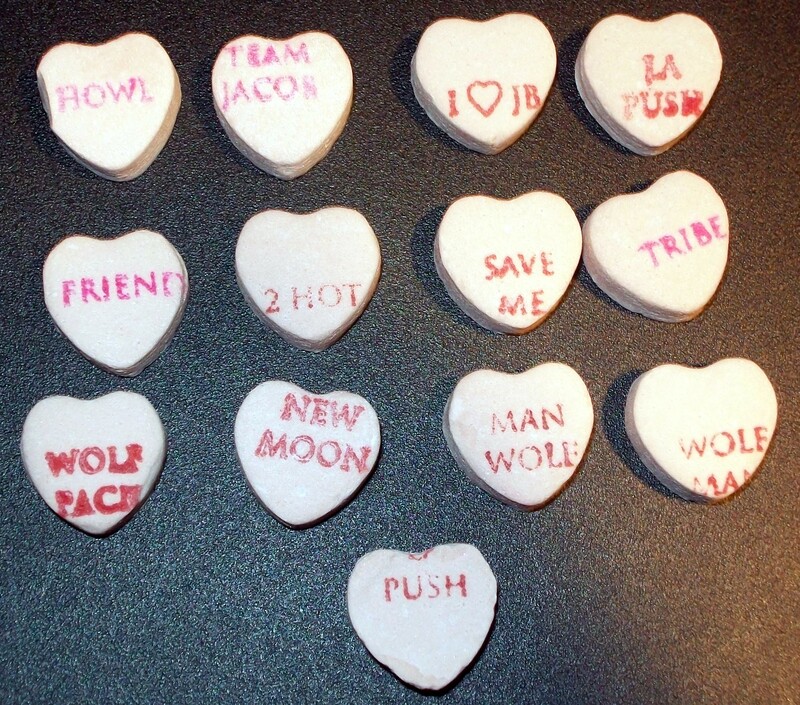 But anyway, in case it’s not clear from the picture, the hearts are printed with the following words/phrases: “Howl,” “Team Jacob,” “I ♥ JB,” “La Push,” “Friend,” “2 Hot,” “Save Me,” “Tribe,” “Wolf Pack,” “New Moon,” “Man Wolf,” and “Wolf Man.” Then I found an offset “La Push” that just says “Push,” which struck me as vaguely dirty and therefore hilarious. WTH? Doesn’t that woman just look like she belongs on an episode of Dynasty? Like, as one of those started-out-sympathetic women who married into the Carringtons and learned to be ruthless in the interest of self-preservation? But the book, The Silver Touch, is hugely enjoyable. I’ve renewed it once already (I made the mistake of checking it out right before entering deadline hell) and racked up some fines on it to boot. 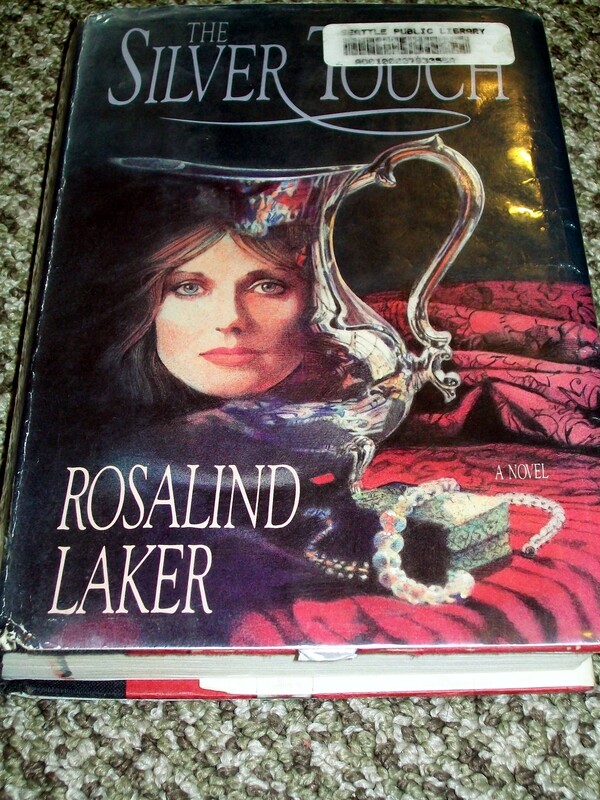 Evangeline tells me author Rosalind Laker has a number of excellent historical novels, with romance in them, and now I think I’ll have to read more. I’ve learned a heck of a lot about silversmithing without ever feeling like I was being instructed. Originally I intended to title this post “What Deadline did to my Fingernails,” and to start it off with a photo of said fingernails, accompanied by raggeder-than-they’ve-ever-been cuticles. Only once I actually took the photo, and looked at it, I realized this was Something Nobody Needs to See. Suffice it to say I’ve bitten the living heck out of my fingernails in this past month, and couldn’t even spare time to file them into short-but-even shapes, so they look… well, you don’t want to know. The month before deadline turns out to be a little like the month after you bring a baby home: things you’d thought were essential (yard work, social obligations, personal hygiene) just fall by the wayside. And naturally it turned out to be a hectic month on the homefront, including two birthdays (just in the past two weeks), an unplanned wisdom-tooth extraction for one of the kids, and, to wind things up with a bang, a cold that kept both kids home on alternating days of this past week before striking me. As with A Lady Awakened, I got about three-quarters of the way through the book when I realized there was no way all the stuff I had planned was going to fit in the word count that remained. So I had to rethink, and cut stuff as I went along, and then go back and cut some more. Continuity turned out to be a bear with this book, too. Partly because of how much earlier stuff I had to cut, and partly because part of the plot revolves around winning money at cards, and I had to keep track of how much each character had at any given time. So now I’ll take a week or so to tend to all the real-life things I’ve let slide the past month (this morning I took our vacuum cleaner to the repair shop – if I were cruel I would post a picture of our hasn’t-been-vacuumed-in-over-a-month floor), and then I need to roll up my sleeves and get started on the next book, which at the moment is terrifyingly nebulous. Oh, great. The vacuum repair shop just called and our v.c. is broken beyond repair. So before I can start researching the next book, I have to research vacuum cleaners. How anybody manages to combine writing with family with a full-time job is utterly beyond me. 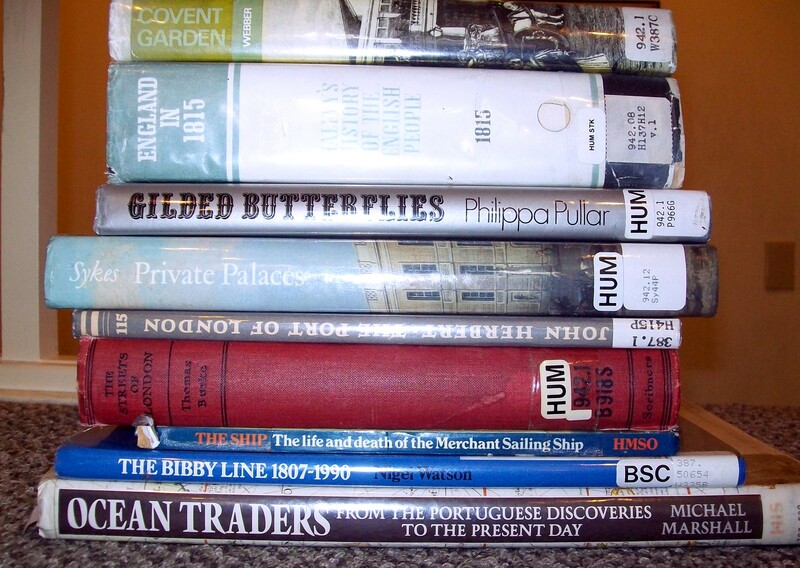 And lucky for you I do, otherwise you’d now be subjected to a lengthy diatribe all about how what I don’t need to be doing right now is reading and re-reading a new story featuring In for a Penny characters when I should be writing! Because trust me, I fritter away enough time re-reading In for a Penny itself.